Operating a business or a corporation entails an innate knowledge of how much it costs to run the business, provide products and services, as well as how to cut corners without cutting quality. Using an operating expense analysis report aids in this endeavor. This report is typically a snapshot of the company’s fiscal health over the course of quarters, semi annually, and annual assessment periods. The use of free templates for the operating expense analysis reports also minimizes the confusion of new employees or management staff in how to enter information as well as assess and forecast using the information. The templates are easy to access, and can be customized to meet the innate needs of the company using the report. After accessing the template on this page, simply fill in the company information in order to customize it to the company needs. This information can include such things as the company name, address, and even contact numbers. The individual may also consider including the company mission statement or even a slogan in these fields. The next step is to set up the fields where the financial information will be entered. This will include such things as entries from the profit and loss statements. Some of these items will include travel expenses, litigation and utilities. 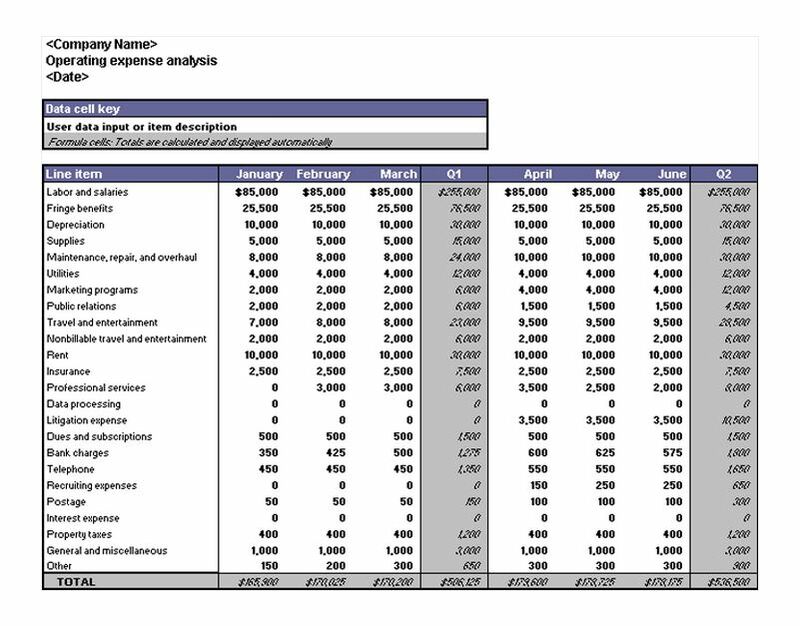 Once all the desired items have been entered into the template the operating expense analysis can be downloaded and saved on company computers, or it can be printed for ease of reference. This template makes assessing the fiscal health of a company easier than having to flip through pages of ledgers and generate hand written pages. The template is free to use as well, so this makes its cost effectiveness a positive thing for the company. Seeing yearly, or even quarterly costs are right in one easy to read format that offers totals as well as individual amounts that the individual can use for presentations to stock and shareholders as well as present to upper management staff. The operating expense analysis offers a way to determine the best marketing and business decisions for the future health of the company. The decision to use the template also saves the manpower that would otherwise be needed to generate the forms and reproduce them in a large enough quantity in order to meet the needs of each entity involved with the business finances.